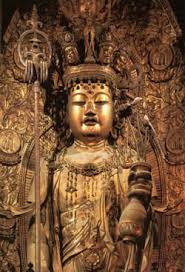 The temple Hasedera in Sakurai Town was built in 686 and is known for its huge statue of Kannon Bosatsu　観音菩薩. As the storms on Hase's hills.
. WKD : Temple Hasedera 長谷寺 .
. Matsuo Basho visiting Buddhist Temples . 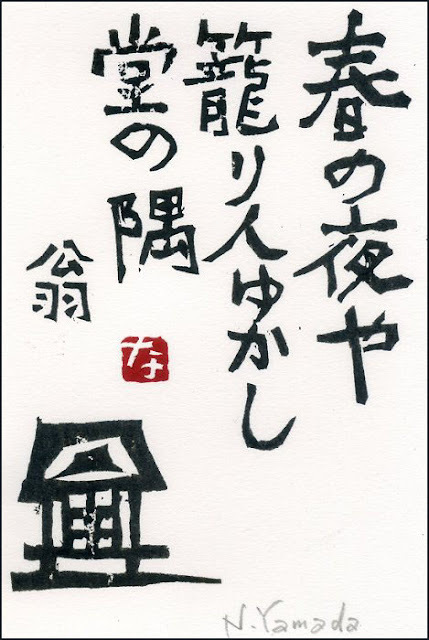 This haiku was composed at Hase, in Yamato, what is now Nara Prefecture, at the temple known as Hasedera, or Kwannon Do, or Chokokuji. 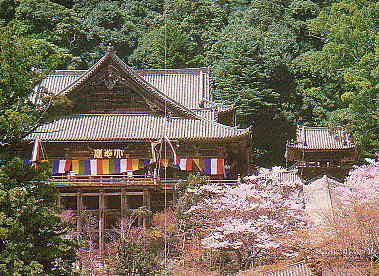 In the Genji Monogatari and the Tsure-zuregusa we find frequent references to pilgrimages to this temple, especially by women to the Kwannon enshrined there. The temple in Hase is known from the Tales of Genji (Genji Monogatari), where ladies of the court came to pray to Kannon to find a suitable lover.
. komorido 籠人 / 籠り人 person in a retreat . 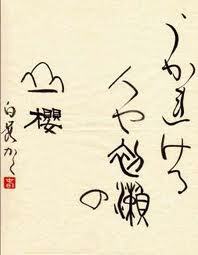 This hokku refers to the waka by Minamoto no Toshiyori, introduced above. 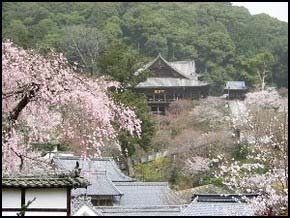 Basho replaced the yamaoroshi wind with the mountain cherry blossoms. at this pass . 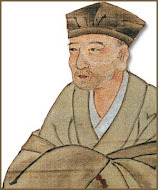 . .
Basho has climbed quite high and was now resting, enjoying the chirping of the lark below him. At the waterfall of Nijikoo no Taki 西河の滝 Nijiko no Taki.
. tsuyu itete hitsu ni kumihosu shimizu kana .